Back in February, I moved all my 401(k) fund allocations into short-term cash. I know we've all been told that retirement accounts are supposed to be long term investments, and since I don't plan on retiring any time soon, it wouldn't make sense to "day trade" with my 401. I had been invested in a mix of foreign, as well as small and large cap domestic funds. I'm not a financial expert, but I did consider myself more informed than average on the turmoil in the markets. I figured it made sense to lay low for a while until stability returned. Needless to say, we (now my wife and I) are still 100% cash. So what are you guys doing with your retirement investments? Max, timing the market is risky business. When the reversal happens, it happens with vengeance and unless you time it perfectly, waiting until the market is in extreme distress to buy back in, you can very will miss 5-10% of the initial bounce, putting you right back to where you are right now. Wow, that was a run-on sentence. With the strong dollar and commodity sell off, I would be buying into a small-cap fund along with a large cap growth like the Dow 30 index. People get paid lots and lots of money to time the market and can't seem to do it consistently. We are about to retest the July lows and I think we are soon approaching the time to get back into the market. I will admit I am in all cash in my 401k as well, but today I bought back 25% of the portfolio. I got really, really lucky earlier this year and made huge gains in my 401k, so I feel okay being out for a bit. I work for Wells Fargo and put 100% of the funds in Wells stock the day before earnings. The next day I was up 30%. Bottom line, if you have 10+ years before you retire, just keep the money invested. These little blips don't mean anything in the long run. With my retirement funds, I make subtle changes in allocation from time to time (sm cap, lg cap, growth, foreign) but I'm always 100% invested in stock mutual funds. I'm not a market timer. Actually, the S&P500 looks cheap to me right now, so I've been allocating more that way this year and will probably continue to do so as growth slows next year. Of course, how one invests depends on the years to retirement and individual risk tolerance. One thing I'm sure we can agree on: real estate is not a good investment now. That's the common wisdom, for sure. It just seemed silly to stay in, knowing what I know. At this point, I'm looking for a reason to get back in, and I can't find one. Aside from all the secular arguments (net withdrawals from baby-boomers etc), there aren't a lot of long term outlooks that make sense to me. I will probably buy the dip if we have a sharp correction, but other than that, I'm standing pat. I should say, "secular bear arguments." A simple but extraordinarily effective timing indicator that will keep you in for most of a bull move and keep you out for most of a bear move. This indicator said GET OUT in February and still says stay out. I'm all in cash/short term treasuries right now, aside from a few strategic puts. Very nice, darth. In the video, he mentions the 1987 crash, which was a true black swan. I would add that black swans (both up and down) should be treated as random events and won't have a long term portfolio impact. 9/11 was a big down event also, but the timer had people out so it isn't mentioned. We're all cash as well. I don't know what will trigger me to jump back to my previous allocation, but I'm not in any hurry right now as I expect more turmoil before things get better (Alt-A and all of that). You'v made the easy choice of the two decisions that need to be made. Now you're presented with the tough decision, when do you get back in. The comment, "when things get better" is the funniest comment I always here. Number 1, please quantify what the hell that means. Does the market go up 10%,20%,30% etc? Are bottoms in any investment made during good times? No. Bottoms are made when times are bad, that is why the underlying asset is at a low point. I would encourage you to look at the actual level of the S&P 500 the day you went to cash, and look at it now. If you've been able to save a couple of % points, I would take the opportunity to use the current weakness to re-enter the market. Dollar cost average into the market if you'd like, but just start the process of getting back in. As an example, one week after the bombs dropped and we went into Iraq, the Dow was up 1000 points. Against all conventional wisdom. With investing, go away from the herd. I speak from the perspective of following housing specifically, knowing that all things related to housing more or less are the root cause of the current market turmoil. Whether listed corporations know it or not, there is still quite a ways to go with the housing downturn, which I can fairly assume will mean there is a ways to go with the resulting stock market turmoil. Many more losses have yet to be realized and written down. That much is for certain. What happens to the stock market as a result is still unknown, but so far, it has meant downward pressure. So to answer your question, things getting better to me means when housing gets better - which isn't any time soon. Number 1, please quantify what the hell that means. How about "when it stops going down?" Like I said before, I'm no day trader or expert, but when I get reactions like this, it makes me feel like the sucker at the table. Honestly, how much of the last few years gains happened in one day rallies? How is using the 20/50 average ratio as an indicator any different than dollar-cost averaging your positions? "Whether listed corporations know it or not, there is still quite a ways to go with the housing downturn." What does this have to do with the corporation? It is the market which dictates the price of the stock, not the company's knowledge of the housing downturn. "Many more losses have yet to be realized and written down. That much is for certain." You said it yourself, that much is for certain. The market already knows this and has it priced in. The market will always be one or two steps ahead. The equity markets are not rational either. Try to time it and you will get burned. You will get sucked into the mentality that things are going to get worse before they get better. This is when the market turns and you are holding your you know what in your hands wondering what happened. There will be a huge quick reversal and you will say to yourself, oh, this is just a bear market rally, it will come back down. A year later you are afraid to get back in because it has gone up so much, again you are convinced it must come back down since it has gone up so much and the economy still has problems. You finally decide to get in since the market keeps going up, this is when the market takes a correction. Trust me, I am a professional bond trader and have seen this exact scenario play out with even seasoned pros. Don't mess with Mr. Market in your 401k, that is what trading accounts are for. Oh, and always follow the bond market. It is much more rational. It will always guide you correctly. But then again, I could be biased. "The market already knows this and has it priced in. The market will always be one or two steps ahead." The market has ceased to be a discounting mechanism like you describe and is more of a price-discovery machine. The reason for this is too much leverage, too many quants, and too many hedge funds all betting in the same directions, using similar algorithms and techniques. "The stock market, which is normally thought of as a discounting mechanism, doesn't work that way at the moment. For the better part of at least six months, and perhaps nine, it has traded more like a price-discovery market (think voting machine). That's how commodities such as wheat and corn trade -- they just get pushed from one price to another. Daily reactions are almost totally to price, although fundamentals are loosely correlated. Everyone has grown up thinking that the stock market discounts, meaning it anticipates a company's operational performance and prices a stock accordingly. The market has done so in the past, and it will again. But for now, it discounts next to nothing. Witness the huge gaps seen recently in the subprime sector, where problems seem to have arisen out of the blue -- although they have been easily foreseeable, as I have been chronicling in this column. When the market reverts to discounting and ceases to be the price-discovery animal it is today, there will be a tremendous amount of violence on the downside." In order for the price discovery machine to break, all of the leverage and numerous hedge funds needs to vanish. This is well underway. Once enough of these bad actors have left the stage (leverage and fictitious capital destroyed) THEN we will be able to rely upon the stock market pricing in all of the bad news ahead of time like it used to do. That day hasn't remotely come yet. The indicator I linked above is very reliable and won't let you miss a good bull run. Right now it says STAY OUT. If you buy the dips in this bear market you will get annihilated. Max often ponders the ultra-low interest rates and how they make no sense given the climate. The article above describes the process, and how the wheels will come off said process. Why? Because the structure is fragile and unsustainable. It depends upon constant and ever-larger FCB inflows to finance our mushrooming debt burden - a debt burden that cannot possibly be paid off. Ever. The market has ceased to be a discounting mechanism like you describe and is more of a price-discovery machine. How else can the recent volatility be explained? As assumptions fail, so do predictions. A predictions fail, so do models. As models fail, so do investments. As investments fail, so does leverage. Sure... just like the stock market "knew" there was to be a housing crash that would result in hundreds of billions in losses, but not until several years after many of us knew it. Clearly, the market does not know all and tends to not be good at pricing in losses that companies are working very hard to pretend do not exist or will not occur. Wow, you guys are so all knowing. Max, go ahead and keep you money in cash. Watch as we have a huge rally Monday. The 10 year is turning as I write and indicating a short term bottom in the equity markets. We just hit a double bottom on the NDX and SPX. Now go short the 10 year and you will be happy. What I really can't get, is if you knew about the housing crash before the market was pricing it in, why didn't you take advantage of it? 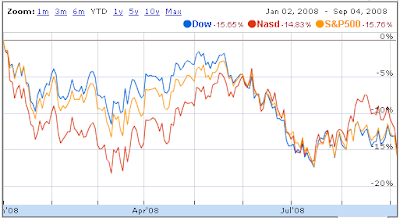 Homebuilder stocks were getting crushed in 2005, but I guess nobody knew what was happening? if you knew about the housing crash before the market was pricing it in, why didn't you take advantage of it? We did. Many bubble bloggers made quite a big of money shorting lenders and builders. I'm no day trader, and I don't have the guts to play the shorting game. I've seen way too many counter-intuitive moves to feel comfortable at that casino. Seriously, how pathetic are we compared to the so-called Masters of the Universe that got us into this mess? Merrill Lynch lost 25% of its profits for its entire history in the last 18 months. how pathetic is that? anon, what are you talking about? Don't re-write history. Most homebuilders were making all time highs in 2005 and some even in 2006! You've actually proved my point for me. If the market was a proper discounting machine, why would that have happened? Homebuilders should have gotten crushed in 2005 and that just didn't happen. Shorting the 10-year would be a good thing, but for a different reason than you think. Mish makes a compelling argument why the rally in the 10-year will continue. Mish is the quintessential deflationist, and I have had numerous arguments with him about the "bond bubble". He's still of the (old school) opinion that bond vigilantes exist and that they will sniff out any hint of inflation. This just isn't accurate. Bond prices are mostly controlled by FCB's willingness to gobble up more and more of the Treasury paper, regardless of price. Year in and year out this has been the case, and certainly for the last 15-20 years or so it has been the dominant force behind the low rates. During this time there have been periods of high inflation, yet bond prices continue to move higher, and yields lower. Lee Adler in the article above does a good job of showing that inflation and bond prices are only sort of loosely correlated because of various distortions, and at that, are only correlated after a significant lag period of months, if not years. Where Mish blows it is bond prices just aren't about inflation at the moment, they are more about currency pegs and the currency regime - what Russ Winter refers to as the Godfather Protection Racket. Mish uses bond prices as "proof" that deflation exists, but what he doesn't realize is that a bond collapse is the surest way to bring about deflation! Forget 1929, that was only a warning signal. The real trouble didn't start until the 1931 bond collapse. That sent the economy into a protracted tailspin with a interest rate spike. And the spike didn't last long either, maybe 18 months or so, but that was enough to crater all of the "flight-to-safety" crowd. Long-term Mish is right. Rates don't have to be high because we ARE in deflation, and inflation won't be a problem for a long time. We just disagree about the necessary bond-yield spike, which will be yet another implement of fictitious capital destruction. Look out east wedge, here comes the wave!! Max... as the saying goes, "LONG time listener, first time caller". You and I are on the same page amigo. I'm 20 years from retirement, but have followed the same strategy over the past year. I realize I've got a long term horizon, but it still makes no sense to ride out a correction I knew perfectly well was going to happen. The way I see things, why not preserve $100 instead of watching it trade down to $50 and then hope it eventually makes it back to the original $100? I've never been hugely invested in equities, and to be honest, I see this as my once in a lifetime opportunity to make a killing. The S&P500 is going to trade down to 900. When its there, I'll throw my money back into stocks. I'm a trader and it really frustrates me when the talking heads spend all day trying to remind the mom and pop retail investors that they're supposed to be "investing for the long term". Same thing with equity research analysts. If a stock is now trading at $50 and 10 years from now its trading at $70, the pumpers would say: "that was a great investment... you made $20". But what if it first trades down from $50 to $15? I'd rather get in at $15 and make the $55 return instead. Stay the course my friend. This is going to continue to get worse.